The new cassava peel processing initiative is supported by Synergos Nigeria, federal and state governments, the World Bank, Fadama III, the Kogi State University, and ILRI Nigeria in Ibadan. ILRI organized the training on the production of high-quality cassava peel mash. A prototype cassava peel processing plant was launched in Djakarta community of Kogi State in Mar 2017. A month later (Apr 2017) a similar factory was launched in Benue State. 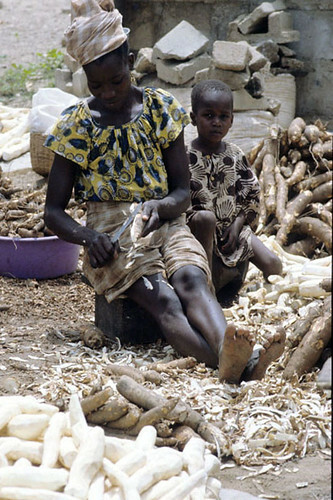 Each year, nearly 98% of Nigeria’s cassava peels are wasted due to constraints associated with drying and concerns about safety of use, particularly hydrocyanide and mycotoxins-related food poisoning. Drying peels outside—practically impossible during the rainy season—takes two to three days. Consequently, peels are left to rot in heaps or set on fire—polluting the nearby air, soil and groundwater and wasting a potential feed resource. According to Premium Times of Nigeria, the ‘prototype idea, if it works, ‘will be sold back to government with the expectations that it will get investors to invest in the system, and lead to job creation in different fields’. Over 90% of the cassava peel equipment used in the factory is made using local raw materials. Agric innovation to convert cassava peels to livestock feed takes off in Kogi, Premium Times (Nigeria), 30 Mar 2017. Kogi Gov inaugurates cassava factory, PM News (Nigeria), 24 Mar 2017. What are all the machines/equipment needed to be able to effectively be involved in the process of turning cassava peelings to animal food?